It is not enough to have a vehicle that is just powerful. You need a vehicle that makes them most out of their power and performance. 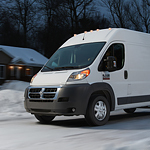 This type of vehicle is the 2018 Ram ProMaster. We are amazed at what it can do with the features that it has which is why we have chosen it for out St. Paul Chrysler Dodge Jeep Ram inventory. While the Ram ProMaster has a decent enough engine, one thing that you are going to notice that makes it more powerful in different ways is the thermal management system. This type of system increases the efficiency of the system. Another good thing about the efficiency of the ProMaster is that you do not have to change your oil until you reach every 10,000 miles. This means that you have a lot of driving to do in between the oil change that you would need more frequently with other vehicles.